In a quaint Thomas Kinkade village, merry Christmas revelers gather'round a brightly-lit tree in the heart of town, singing cheerful carols while an old-fashioned train circles nearby, a nostalgic reminder of seasonal family travels. 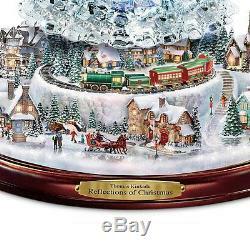 Now, the Thomas Kinkade Reflections of Christmas Tabletop Tree brings together all of those fond holiday memories in a Masterpiece Edition FIRST.. 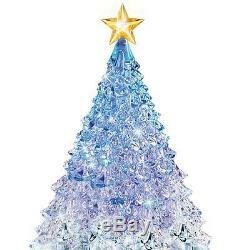 Alive with color-changing lights, music and action, this breathtaking crystal tabletop tree is clearly unique, and instantly ready to bring the big-time festivities of a small-town Christmas into your holiday home. 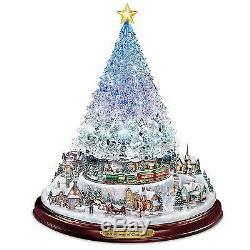 This one-of-a-kind Thomas Kinkade tabletop tree is superbly handcrafted with sparkling, faceted genuine crystal and hand-painted for intricate detailing. Hidden within the crystal tree are long-lasting LED lights that light up the tabletop tree with vivid changing colors that dance on the boughs of the tree and spread a festive glow across the fully dimensional sculptural Thomas Kinkade village that surrounds the base. Then, at the press of a button, an old-fashioned miniature train circles around the tree to a delightful medley of eight favorite Christmas carols. 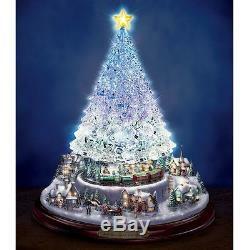 Very strong demand is expected for this limited-edition Thomas Kinkade tabletop tree, so don't delay. An old-fashioned, miniature train, with raised-relief accents, a traditional steam engine, coal tender, two passenger cars and a charming caboose, rotates around the base of the tree, just as it would on Christmas morning. Plays a medley of 8 favorite Christmas carols, including "Jingle Bells, " "Deck the Halls" and more. Presented on a handsome base with a gleaming title plaque. Measures 10 H; 25.4 cm H. Please read product descriptions very thoroughly. The item "Thomas Kinkade Color Changing Lighted & Mustical Christmas Tree Sculpture NEW" is in sale since Monday, February 05, 2018. This item is in the category "Collectibles\Holiday & Seasonal\Christmas\ Current (1991-Now)\Figures\Other Curr.